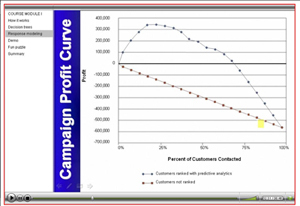 Predictive Analytics Applied includes four jam-packed training modules of 60-90 minutes each, totaling 5 1/2 hours of viewing time. This online program is internationally-friendly - registrants have participated remotely from Canada, China, Finland, France, Germany, India, Italy, The Netherlands, Portugal, Russia, Scotland, South Africa, Turkey, United Arab Emirates, United Kingdom, United States, and Uruguay. The president of Prediction Impact, Inc. and the conference chair of Predictive Analytics World and Text Analytics World, Eric Siegel is an expert in predictive analytics and data mining and a former computer science professor at Columbia University, where he won the engineering school's award for teaching, including graduate-level courses in machine learning and intelligent systems - the academic terms for predictive analytics. After Columbia, Dr. Siegel co-founded two software companies for customer profiling and data mining, and then started Prediction Impact in 2003, providing predictive analytics services and training to mid-tier through Fortune 100 companies. 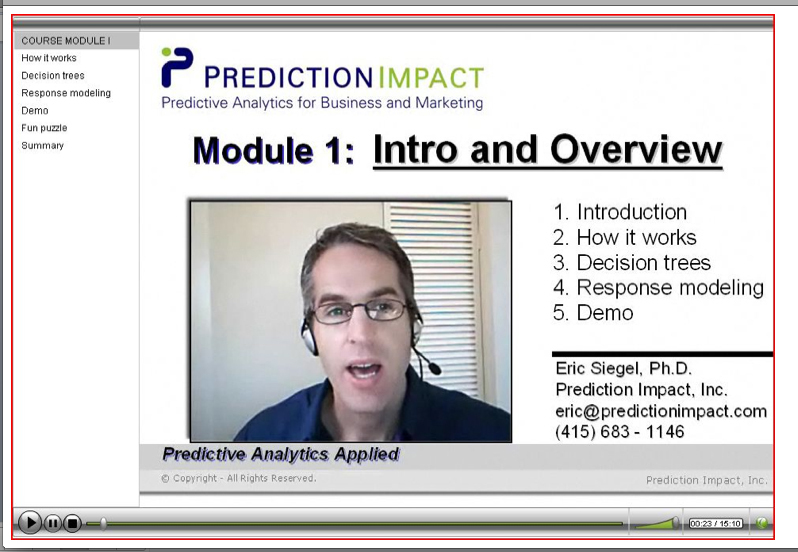 Dr. Siegel is the instructor of the acclaimed training program, Predictive Analytics for Business, Marketing and Web, and this online version, Predictive Analytics Applied. He has published over 20 papers and articles in data mining research and computer science education, has served on 10 conference program committees, has chaired a AAAI Symposium held at MIT.